At Lovell FHCC, we are committed to providing high quality, compassionate and comprehensive health care to women veterans. 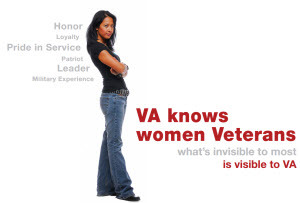 The Women Veterans Program is designed to offer the respect, dignity, and privacy women veterans deserve while meeting their unique health care needs and delivering the highest quality health care to each woman. We encourage women veterans to utilize these benefits. We provide comprehensive primary care, gynecological care, specialty care, and integrated mental health care. Lovell FHCC offers comprehensive primary health care to women at the main facility in both the Women’s Health Clinic as well as the Primary Care Clinic. Comprehensive primary care is also available at our outpatient clinics located in McHenry, Evanston and Kenosha. If you have experienced Military Sexual Trauma, contact Delia De Avila, LCSW, MST Coorindator, at 224-610-5843. Each veteran is unique. Call 224-610-1463 for help determining your individual eligibility status and enrollment into VA health care. If you have any questions or would like to request additional information, the Women Veterans Program Manager is ready to assist you. Please call 224-610-1123 to talk to our Women Veterans Program Manager. Or you may contact our Primary Care Women's Health Clinic directly at 224-610-7615. NEW: Direct-schedule your mammogram by calling 224-610-7642 or 224-610-7647. Mammograms, Pap test, blood pressing check, cholesterol check, Bone Density Test, Colorectal Screening, Flu Shot, and other immunizations.